During New Testament times babies, especially male babies, were considered a great blessing, the very “salt of the earth.” Therefore when a baby was born into a family it was washed with water, rubbed with finely pulverized salt, then rubbed with oil, and lastly swaddled. An illegitimate baby could not be salted or swaddled. 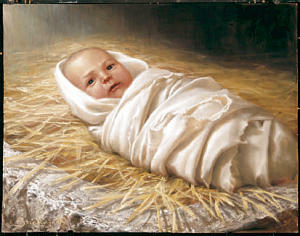 The swaddling was done by first placing the washed baby diagonally on a swaddle cloth. The infant was then rubbed with finely powdered salt and oil. The cloth was then brought up and over the baby’s arms, legs, and torso. Next the end of the swaddle band, made by tying together strips of linen cloth about four or five inches wide and up to six yards long, was held under the baby’s chin, then wrapped up over the forehead and then around and around the infant all the way down to the feet. Swaddling kept the child warm, restricted movement, and it was also thought that it ensured the baby would grow strong without deformity. Because of this a swaddled baby is a metaphor for a legitimate child that is loved and properly cared for. Thus Ezekiel says when chastising Israel, “Thy birth and thy nativity is of the land of Canaan; thy father was an Amorite, and thy mother an Hittite. And as for thy nativity, in the day thou wast born thy navel was not cut, neither wast thou washed in water to supple thee: thou was not salted at all, nor swaddled at all” (Ezekiel 16:4). In other words, Israel is so wicked they have become illegitimate children. They have chosen to be children of the Hittites and the Amorites (children of the world) rather than be legitimate children of their Heavenly Father who would have swaddled and loved and cared for them. I love this small detail about Mary swaddling her baby because it tells us so much. First of all it gives us a glimpse into the heart of Mary who cared for her child in the best possible way. To us Jesus Christ is our Master, our Savior, our Protector, but for a time to Mary He was a dependent child. That is a relationship no one else will ever share with Him. But there is something else. 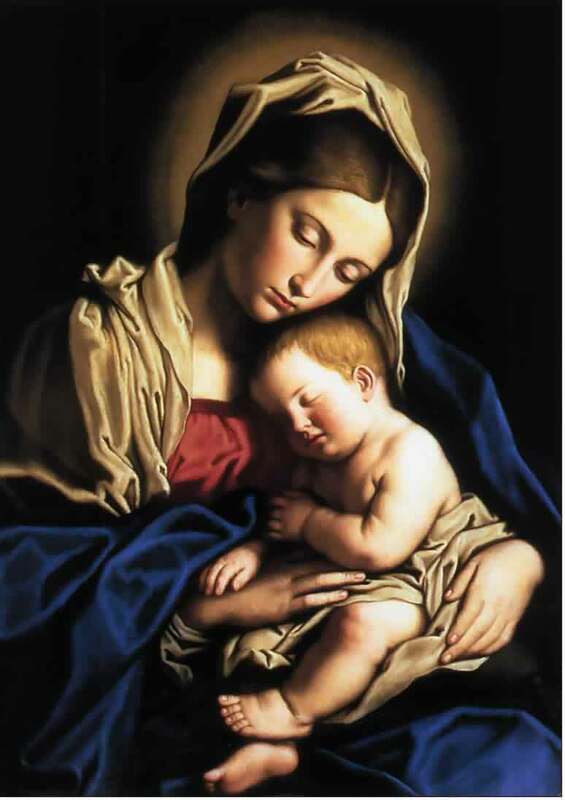 Of all people, Mary knew the significance of this child and the circumstances concerning His conception. She knew that despite the rumors and hatemongers this child was legitimate and so by swaddling Him she proclaims to the entire world that her baby is God’s legitimate Son. One can only imagine what Mary thought as she wrapped Him. From the moment of the miraculous conception, if not before, Mary must have sought for any information about the fate of this child. There were many prophecies, and Mary must have hung on every word the rabbis and others said about the coming Messiah. She must have asked questions and in the answers would have discovered the terrible fate that awaited her little boy. Therefore, did wrapping Him in swaddling clothes make her think about the fact that one day He would be wrapped in similar looking grave clothes? Did seeing him wrapped tightly in the bands of birth make her think of the bands of death that would surely come to Him? Whether she thought about any of these things or not, the bands Mary swaddled her Son in remind us of the day He was wrapped in burial linens and placed in a tomb. He was born to die for us, and by so doing He “swaddled” us, proclaiming us His legitimate children and providing a way to take away our “deformity.” But most important, Jesus Christ has changed our burial linens into the swaddling bands of new birth. I am truly enjoying your posts about Christmas symbols. It has been fun to learn more! You have a gift for uncovering and sharing important information that brings us closer to Christ. I found this on "The Savior of the World" site on lds.org: "While the groom built their new home, the bride also made preparations, including the embroidery of the swaddling bands with which the couple’s hands would be wrapped under the wedding canopy. Later these bands would also be used to secure blankets or swaddling clothes around the couple’s infant children. The symbols on the bands often indicated family history.11 Mary was from the tribe of Judah, so she may have used symbols common to that lineage such as a lion, a lamb, or a tree of life. As a descendant of David, she was also entitled to use the royal colors of blue and white. The symbolic significance of swaddling bands was so important that the embroidery on each side of the swaddling bands had to match exactly, with “right” and “wrong” sides indistinguishable. This symbolized the complete harmony of inner and outward life.12"
Thanks for encouraging my love of symbolism Sherrie! To see why I don't have long hair anymore click on picture and then read about my adventure with the tumor I named Grizelda. Please do not use any of the written content on Good News! without permission. © 2011 sherrie mills johnson, all rights reserved. For permission contact me at smillsjohnson@gmail.com. For a daily dose of encouragement . . .